The MARCI acquires a global view of the red planet and its weather patterns every day. Please click and play the movie (.mp4 file) to see how the weather on Mars changed during this time. 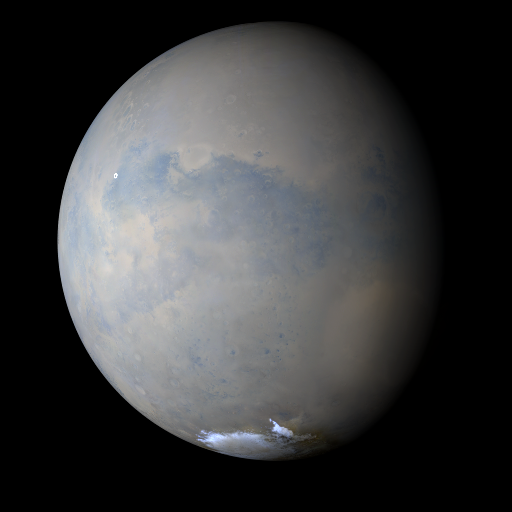 Multiple local-scale dust storms picked up along the seasonal south polar ice cap of Mars this past week. This activity that extended over Aonia, Cimmeria, and near the Mountains of Mitchel generated a diffuse dust cloud along the cap edge. Looking to the mid-to-low latitudes, dust storms were more sporadic with occurrences spotted over Noachis and Cimmeria. Afternoon water ice clouds were observed south of Eos Chasma in Valles Marineris and above Arsia Mons, the southernmost volcano of the Tharsis Montes. Dusty conditions persisted over the rover sites in Endeavour Crater (Opportunity) and Gale Crater (Curiosity) all week. This week’s MARCI “movie” can be downloaded HERE (9.0 MB .mp4 file). This week’s MARCI “movie” can be downloaded HERE (9.0 MB .mov file). Earlier Mars Weather Reports are available HERE. The movie (a .mp4 file that you can click and play, above) was generated from images obtained by the Mars Color Imager (MARCI) onboard the Mars Reconnaissance Orbiter (MRO). During a nominal operational week, a total of about 273 MARCI images, taken in three of the camera’s seven color filter bands (420, 550, and 600 nanometer wavelengths), are map projected and mosaiced together to produce seven false-color daily global maps. These maps are then projected onto a sphere with north at the top and east to the right and with the mid-afternoon vantage point of an observer in the orbital plane (the imaginary plane that the planet draws out as it circles the Sun). Black areas in the movie are the result of data drops or high angle roll maneuvers by the spacecraft that limit the camera’s view of the planet. Equally-spaced blurry areas that run from south-to-north (bottom-to-top) result from the high off-nadir viewing geometry, a product of the spacecraft’s low-orbit, 250 km x 316 km (155 miles x 196 miles). The movie is rendered at a lower resolution than the intrinsic 1–2 km nadir resolution that the MARCI provides, so that it is practical to view and share via the Internet. The small white circles on these images of Mars indicate the locations of the Mars Exploration Rover, Opportunity (on Meridiani Planum), and the Mars Science Laboratory rover, Curiosity (in Gale Crater). Other locations on Mars referenced in the weather report can be found by referring to the map below. Note that the still image of Mars depicted at the top of this page is a single frame from the movie. The image(s) and caption are value-added products. MSSS personnel processed the images and wrote the caption information. While the image(s) are in the Public Domain, NASA/JPL-Caltech/MSSS requests that you credit the source of the image(s). Re-use of the caption text without credit is plagiarism. Please give the proper credit for use of the image(s) and/or caption. Malin, M. C., B. A. Cantor, A. W. Britton (2018), MRO MARCI Weather Report for the week of 10 September 2018 – 16 September 2018, Malin Space Science Systems Captioned Image Release, MSSS-548, http://www.msss.com/msss_images/2018/09/19/. Malin Space Science Systems (MSSS) built and operates the Mars Science Laboratory (MSL) Curiosity rover Mast Camera (Mastcam) and Mars Hand Lens Imager (MAHLI) and Mars Descent Imager (MARDI), the Mars Reconnaissance Orbiter (MRO) Mars Color Imager (MARCI) and Context Camera (CTX), and the Jupiter Orbiter (JUNO) camera (Junocam). MSSS also built and operated the Mars Global Surveyor (MGS) Mars Orbiter Camera (MOC). In addition, MSSS built the Mars Odyssey (ODY) Thermal Emission Imaging Spectrometer (THEMIS) Visible (VIS) camera subsystem, which shares optics with the thermal infrared instrument and is operated at Arizona State University (ASU). MSSS also built the Mars Descent Imager (MARDI) for the Phoenix Mars Scout lander and the suite of high resolution cameras aboard the 2009 Lunar Reconnaissance Orbiter (LRO). MSSS is currently working on cameras for the 2016 Origins-Spectral Interpretation-Resource Identification-Security-Regolith Explorer (OSIRIS-REX) mission and the 2020 Mars Science Laboratory (MSL) rover mission. Malin Space Science Systems, Inc., San Diego, California, U.S.A.